A new challenge on LiveLoveCards.....Rainbows!! Hello every one and thank you for visiting: I'm participating in the April Rainbow Challenge over at LiveLoveCards which is the blog of a dear friend, Darlene De Vries, who is one of the most talented crafters I know. Her blog is dedicated to exploring new techniques and products from all kinds of companies, giving us who follow her, a fantastic glimpse of what's new and hot out there in the vast and fabulous card making industry. This acrylic stamp/die I used is from Sizzix and it's called Welcome Home , I bought it at Hobby Lobby at a clearance sale for very little money, I'm always looking for bargains!! I colored the little houses with Prismacolor pencils and baby oil, I've done other cards using this technique, it's fun and easy to do. You do need some paper stumps, I get mine also at Hobby Lobby. I created the "grass" by tearing some scraps of olive green card stock and then, sponging them a little with SU Mossy Meadow ink pad. The Rainbow was made with a die set from a Spellbinders circles, I really wanted to represent every color of the rainbow so the last color was snipped after I traced the outline of the last small circle in this set. I added some Wink of Stella to the Rainbow to make it shimmer, here is a close up. I hope you like this card, I sure had fun making it. I thank you so much for visiting and leaving me a comment, I read every single one and they always make my day. If you have any questions about this card, please don't hesitate to ask, I will answer you the best way I can. Hello everyone: Well, I don't know about you but I just love, love the In This Together stamp set from SU, this very chic ladies look lovely no matter what color you give to their fabulous outfits so, once again, I made another card with this fabulous set, this time for the Pals Paper Arts sketch challenge, here is my card. I also used another SU stamp set called Corner Garden which is also beautiful, I only used a strip of it to fit my card but the whole image is amazing. Here is a close up of this sweet girlfriends and the pretty flowers from this set. I hope you like this card, both this sets are beautiful and a joy to color. This are the SU markers I used for this images, as always, they are just perfect for water coloring. Pacific Point, Tempting Turquoise, Rose Red, Regal Rose, Pumpkin Pie, More Mustard, Daffodil Delight, Garden Green, Old Olive, Sahara Sand, Early Espresso, Basic Black and Chocolate Chip. I also used a bit of my Strawberry Slush and Hello Honey ink pads, since I don't have the markers in those colors. I used Strawberry Slush and Whisper White CS, a SU tiny pearl and Rhine Stones I colored with alcohol markers. I want to thank you for visiting my blog and for your sweet comments, I'm no expert but, if you have any questions, please don't hesitate to ask, I will answer them the best way I can. Before I forget, here is the Pals Paper Arts sketch that inspired this card. Have a wonderful weekend. 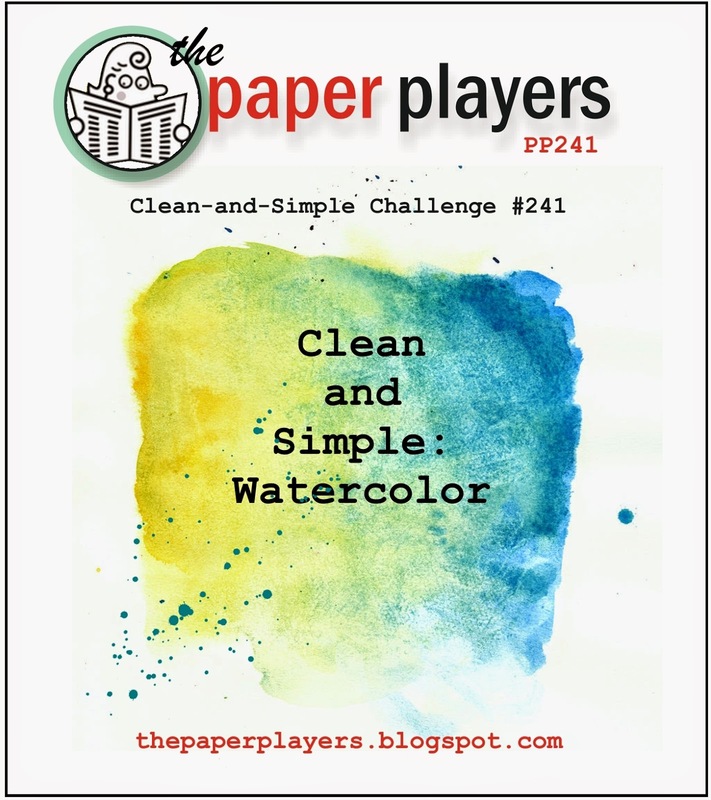 Hello everyone: This week's challenge with The Paper Players is right up my alley because it calls for water coloring, which is just about my favorite medium. I chose a brand new Stampin Up! set called In This Together , this delightful set arrived at my house last week and I just LOVE IT!!! Here is the card I made with one of the images for the challenge. 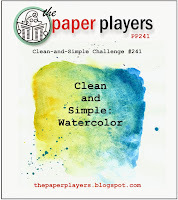 I chose very soft water coloring, using as always, my Stampin Up! markers and the Aqua Painter. I added a bit of bling to her fabulous coat with some Rhine Stones and one teeny, tiny SU pearl to her pretty purse. Here is a close up, doesn't she look just so pretty? I hope you like this card and I thank you so much for visiting my blog. I want you to know I appreciate wholeheartedly your comments and, if you have any questions, please don't hesitate to ask me. I'm not an expert, by any stretch of the imagination but I do love this craft. and the list of materials I used to create this card. Paper: Canson water color paper, Lily of the Valley DSP. SU Markers: Rich Razzleberry, More Mustard, Tempting Turquoise, Old Olive, Early Espresso, Regal Rose, Elegant Eggplant and Sahara Sand. The brads and Rhine Stones are from my stash and the little pearl on her purse, is from SU. Thank you again for visiting today, I have another project for another challenge I'm entering, I will post it soon.